If you need to tear off the installed adhesive, you can use a hair dryer to heat the adhesive surface, then tear it off. Works on a variety of surfaces. 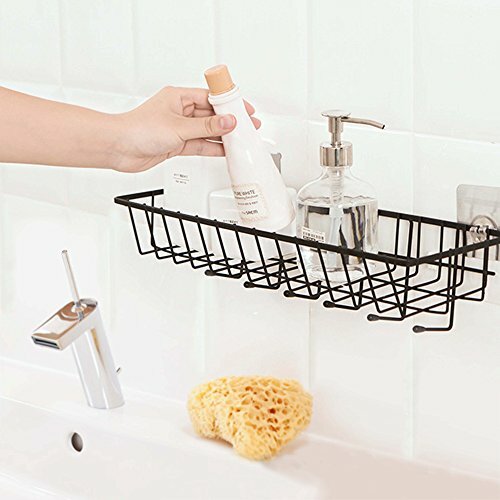 Ideal for bathrooms, cabinet, kitchen to organize your space in neat. Power adhesive making sure attached surface firmly. 1. ONLY stick the shelf on smooth hard surfaces. 2. Please DON'T stick the shelf on painted walls or wallpapers as it will take off your paint or wallpapers. NO DAMAGE INSTALLATION :Two adhesive pads installation without drilling or wall damage. 100% SATISFYING WARRANTY: Fully refund at any time once you are not happy with it. If you have any questions about this product by Easy & Eco Life, contact us by completing and submitting the form below. If you are looking for a specif part number, please include it with your message.